Cimer Amor is a producer from Philadelphia, you might know him as a half of the CAEN Project, or the beatmaker of the latest Sabac Red video “Empty-V” or the works with AOTP members. He is about to drop a solo record called Taking Nowhere Somewhere. Wel,l I am Cimer Amor, CA, the producer and Equinox, EN, is the emcee. We started out just working on a couple songs together. We liked how they turned out and desided to record a whole album entitled “Ceasars’ Vengeance” available on iTunes, ughh.com, and other digital music outlets. It is a one producer/one MC group, it was a plan to you to keep that kind of classic tradition? It just worked out that way. But groups like Gangstarr and JMT are also an influence for us. Their work ethic and ability to maintain a formula for uncompromising sucess is something we are trying to repeat. Your latest album “Caesars’ Vengeance” is out for a while, how would you describe the vibe? Tuff, gritty and well rounded hiphop sound. It’s about releasing aggression and feeling. Not holding back. You are from Philadelphia, the home of The Roots. How much they are influental to the hiphop of the city? Black Thought is one of the most illest emcees. He is not as big as influence on the Philly sound as he once was. But The Roots will always be seen as an inspiring forumla for sucess from an independent level to where they are now. Amir still can be seen poppin in the Philly hiphop scene from time to time. Other very notable artists from the town are Bahamadia, Freeway and Beanie Sigel. How they influenced you? Bahamadia is one of the best female emcees period. Beanie Sigel, as well as, Freeway are inspiration on how to maintain high level of hiphop. Keep that hunger alive. You produced the latest video of the legendary Non Phixion MC Sabac Red. How that all came together? 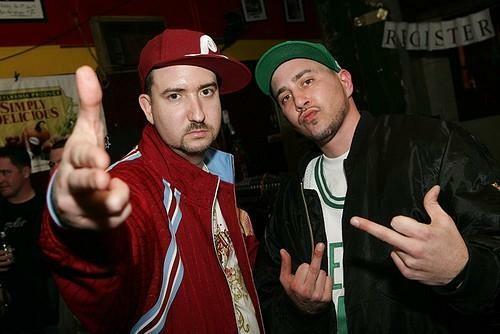 I first meet sabac through Vinnie Paz, but after I meet Sabac, I was working with an ill emcee, Phil Harmonic, and he would up doing a song with Sabac. Sabac loved that song … a shame personal beef Phil and his business partner at the time never let the album to be released. When Sabac started working on “The Ritual”, he hit me up for beats because of the song with Phil. I started sending him beats. Once he realize our conection through Vinnie, we kept emailing each other. I would send him beats. Finally he asked for a southern style bounce track. And that became “Empty-V”. The Army Of The Pharaohs team is very strong in Philly and you already worked with the likes of King Syze or Outerspace. Whats your relationship with the crew? AOTP, especially the Philly side of it, is crew. King Syze, Doap Nixion, Outerspace, Des Devious, Faez One, Equinox are also part of the QD. So its only natural we (CAEN Project) are cool with them. I did songs on Doap amd Syze’s albums. Worked with King Mangnetic. Reef has been peoples for a minute. I am peoples with Vinnie Paz. I was once roommates with Yan and Vinnie was considered the 5th roommate because he was there hanging out so much. It’s all family. We are friends beyond music. Diverse. I do not let any one style or image consume me. I make music according to my mood. I have the agressive style with CAEN Project but have a soulful side when working on some tracks with Side Effect. I’m working on a jazzier, portishead-styled album with my home girl Daniela Romeo. I have an mainly no sample graff influenced EP with graff writer Endm of Doug Pray’s Infamy The Movie. I also started to work with some Philly street bols like Miz Maf. Each is different. Each has is own space. But each has elements that are common too. So I am not afraid to expand and change up my style. As long as the end result is top notch quality music. You are working on a solo album now. Whats the main difference artistically from CAEN Project? There is not a whole lot of difference with this album and CAEN Project. It was just a matter of working with other people beside Equinox and Side Effect who I normaly work with. It’s a reminder I am still here. Making moves and evolving my sound. It’s a bridge for me to work on newer projects. Also a shout to my graphic designer Tim Longthorn, he helps me maintain my brand of music visually. Who are the main MC’s you invited there? Side Effect and Equinox are on it the most because that is my musical family. But also featured are Baby Blak, Burke, Rellik (who with Equinox are Poynt Blanc), Jakk Frost, Sha Stimuli, King Magnetic, Emen, Daniela Romeo, Product, Snowgoons are on the cuts, Rockie Reyes who was featured on JMT’s VOG, L.F. Daze loud.com’s battle champion I think thats it… yeah, that’s it. Release this solo album entitled “Taking Nowhere Somewhere”. There are free songs that did not make my album on http://cimeramor.bandcamp.com Finish the album I am working with Side Effect, which I am really excited about. There will be some contraversial tracks on that one that make you think. That will be my next release after TNS. Finish the project with Daniela Romeo. No one is gonna expect me to come out with the sound that evolved out of this album. Start working on a new CAEN Project album for 2011 release. Hopefully tracks I did with Para Bellum, Krush Unit’s Brainstorm make their albums, and my remix of Prose’s song featuring Reef The Lost Cauze makes their album, too. Prose are my peoples from the UK. Work with more Philly bols. Maybe finish the ep I started with Enem. Maintaining and keeping up the momentum I have built so far. You know how I do.